The prominent fashion charm of the role Lee Si Young acted in Wild Romance where she turns into a bodyguard is attracting many viewers’ attention. In KBS drama Wild Romance, Yoo Eun Jae who is the bodyguard for popular baseball player who used to be a judo player is winning praises from audience with her distinctive comedic acting skill. Lee Si Young is also perfectly portrayed the role which has many action scenes in the drama. In addition, the fashion of Lee Si Young is also becoming a discussion topic. 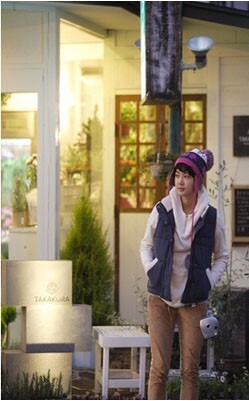 Other than sexiness and feminist charm, Eun Jae is also showing a unique lovely fashion. The white collar shirt and short jacket with a backpack when appearing at the airport gives a lovely fashionable feeling. The cute furry hat on the face combined the important elements of the fashion for this season into one. Especially when traveling in Japan, Lee Si Young transformed completely into a little cute girl with the unique design furry hat. The furry hat wore by Lee Si Young in other photos also stressed the feeling of her lovable. At the same time, because of the fashion style of Lee Si Young, the viewers are paying attention to the drama. On the other hand, how will the love story between Park Moo Yul and Eun Jae in Wild Romance has also attracted a lot of attention.